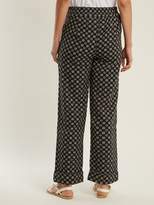 Ace & Jig - Ace & Jig delivers these black Annie trousers in a silhouette-shifting wide-leg cut. They're crafted from custom cotton-gauze with an off-white and black jacquard pattern that's handcrafted in India by textile specialists using traditional looms. They have an elasticated mid-rise waist, side-seam pockets, and finished with turned-up cuffs. Try them on vacation with flat leather sandals and a simple T-shirt.